Cari Makan? Try This Chinese Popiah Recipe. Popiah skin recipe, plus fresh ingredients to start with. Related recipe – Egg Rolls and Spring rolls. To prepare egg skin, into a bowl crack eggs and lightly beat with a fork. Gradually stir in water, then set aside. Into a second bowl, sift flour. Gradually add in egg mixture together with salt. Blend well. Strain mixture to remove lumps. Leave for 20 minutes. Lightly grease a 25-cm non-stick pan with a brush, then heat. Pour on a ladleful (about 3 tablespoons) of batter or enough to thinly spread over base. Cook over very low heat for 2 minutes or until pancake leaves side of pan. To make smooth egg skins, pan has to be just hot to set skin. If it is too hot, skin will turn out perforated. Remove and place on a flat dish. Repeat process, stacking cooked egg skins, until batter is used up. For filling, separately season meat strips and shrimps with 1 teaspoon salt each and set aside. Boil shrimps shells in water for 5-10 minutes for stock. Strain stock and discard shells. Heat oil in a kuali or wok and lightly brown garlic. Add shrimp stock and bring to the boil, then add yam beans and bamboo shoots. When liquid returns to the boil, add meat and simmer gently for 1 hour 30 minutes. Alternatively, pressure cook for 30 minutes. Add bean curd, shrimps and salt to taste. Simmer for 10 minutes more. This filling may be prepared a day early, kept refrigerated and reheated before use. 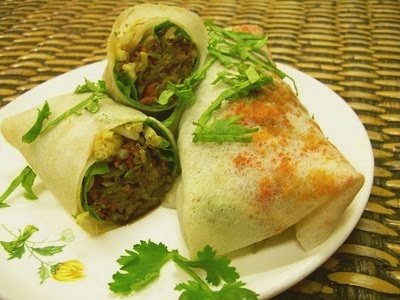 To assemble a popiah roll, put an egg skin on a plate and place a piece of lettuce on top, just below the center. Spread on desired amounts of ground chilies and garlic, as well as black sweetened soy sauce. Top with bean sprouts and cucumber shreds. Drain about 2 tablespoons filling of gravy and place on top, then add on a few shrimps, omelet strips and some crabmeat. Sprinkle on ground peanuts and crisp-fried shallot slices. Fold lower edge of egg skin over ingredients, then fold in left and right edges. Roll up Swiss-roll style. Prepare garnishing ingredients – ground chilies and garlic, scalded bean sprouts, cucumber shreds, steamed shrimps, omelet shreds, crabmeat, ground peanuts and crisp-fried shallot slices – while cooking filling. To cut preparation time, crabmeat can be extracted a day ahead and frozen. Roasted ground peanuts and crisp-fried shallot slices can also be prepared well ahead and kept in airtight containers. love this popiah! will try this tonite!